Checker plate is also called diamond plate or tread plate. It has a raised surface, which provide excellent anti-slip function. Benefit from this advantage, the checker plate is commonly used in the factory, industry and workshop for the anti-slip floorings, floor treads or platforms. aluminium checker plate is made from various materials and has different types and sizes. We will give you a brief introduction of the checker plate. Diamond plate. aluminium Diamond plate is a lightweight plate with the regular pattern on one side surface. The surface has different pattern. Such as the diamond pattern, willow leaf pattern, lentil pattern and round pattern. The most popular pattern is 5 bars of the willow leaf, it has better anti-skid performance than the 2 bars or 3 bars. The other side of the surface is flat, so it is easy to be fastened to the land. A part of expanded metal grating. Diamond and round channel safety grating. 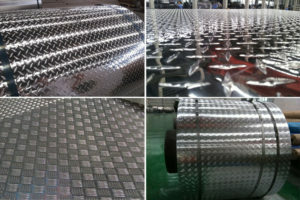 This entry was posted in Aluminium Tread Plate and tagged aluminium checker plate, aluminium diamond plate, Checker plate. Bookmark the permalink.